The Swingyde is a small plastic device that attaches to your golf club and is designed to train your wrist hinge and face alignment throughout your swing. It is frequently advertised on TV and has received positive reviews on amazon and other sites so we decided to take it for a test drive. The Swingyde is a lightweight piece of plastic. 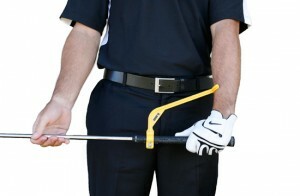 One end clamps onto your clubshaft and the other end angles up towards your wrists. The end near your wrists has a gentle “C” shape that cradles your forearm. Once properly in place, you simply take swings with the club – partial, full, or hitting balls – and the cradle end gives you valuable feedback on your swing plane and club face angle. 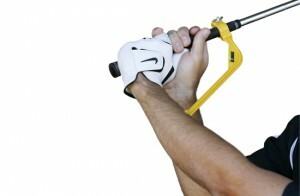 The Swingyde also comes with a DVD that shows you how to install and use the training aid. It isn’t complicated, but one potential downside is that you have to manually screw it onto your club’s shaft to use it. This can make practicing with multiple clubs a bit tedious. The device itself is lightweight and easy to use. It will fit nicely in most golf bags, and it works for both righties and lefties. We found the Swingyde to be very effective at correcting a few specific swing flaws. The “signature position” of the Swingyde is at the top of the backswing (as shown at left). It effectively allows you to feel your clubface angle in this otherwise difficult to see position. It is also very good at preventing you from bringing the club back too far past parallel. If you are specifically trying to square your clubface at the top or shorten your backswing, the Swingyde is a cost effective way to build muscle memory. Technically you can use the Swingyde to check your clubface angle throughout your swing. However, in many of these positions it is easier (and free!) to simply look at the clubface itself. For example, during the takeaway when your club becomes parallel to the ground, your clubface is square if the Swingyde points towards the sky… but the same is true if the leading edge of your clubface is vertical. Swingyde can be purchased at www.swingyde.com for $34.95, a good price compared to many of the alternatives on the market. The Swingyde is good at what it does best. If you specifically want to train a square clubface position at the top of your swing, we would definitely recommend the Swingyde. If you are looking for general swing improvement, are an inexperienced player, or you don’t know what is wrong with your swing, we would recommend a more comprehensive solution. What is the Best Way to Improve Your Golf Game? Don't make a decision without reading our review of the top ways to improve your game! The Swinggyde is also a good tool to train yourself to create more “lag” in your swing. My pro suggested this tool to improve my lag position, or lack of, in my downswing. © 2019 Golfer Reviews. All Rights Reserved.